Hotel Central Boquete i Boquete, Panama: Reservér nu! 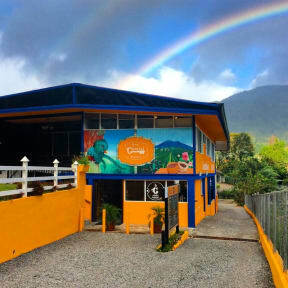 Hotel Central Boquete: we are a family operated fourteen room Bed and Breakfast that combines reception with a Coffee Shop (known to have the best cup of coffee in town!) that has Panama’s first drive thru coffee service. We provide an excellent Full American Style Breakfast and Free WiFi thru-out the whole property. Hotel Central Boquete has a beautiful terrace, balcony and gardens both with Hammocks and Hot Tub and an amazing view. We provide a full (no extra charges) concierge service - Tours, Transportation and Guides, plus a fast & economical Laundry Service (usually just two - hrs!). Hotel Central Boquete is located in a lovely valley on the eastern, sunny side of Volcano Baru (the highest spot in the country at 11,401 ft. / 3,473 m.) in the village of Bajo Boquete, (3,900 ft. / 1,200 m.). It is called “The Valley of Rainbows” or the “Perpetual Spring Valley of Boquete” where no one needs heating or airconditioning, just fans. Boquete produces the most expensive Arabica Coﬀee in the World and 80% of the country’s food. It is a veritable Garden of Eden. All rooms are private and have cable TV, fan, full bedding, towels and shower supplies plus daily maid service. Eleven rooms are full suites with private bath that serve doubles, triples and quadruples. We also have three private budget double rooms with three shared bathroom and two showers, (one open-air in the terrace). Hotel Central Boquete has No dorm rooms. Rooms can be purchased with or without Breakfast (for a 10%discount - Non-refundable). No shared kitchen facilities. Breakfast not included for non-refundable rate (-10%) price is 10 USD per person per day.